Cooking brown rice is not as easy as white and many cooks end up with grains that are still hard or with the innermost part rather gummy. That’s because white rice has the tough outer bran stripped off and what is left cooks very quickly. However, bran is good. That’s where most of rice’s nutrition and fibre comes from so you should be eating more brown rice instead of white. While there’s a technique to cooking perfect brown rice in a stove top pot, that’s a lot of work and you have to monitor it throughout. Any rice is easier to cook in an electric rice cooker, but the best rice cooker for brown rice will make you feel like eating healthy is quick and easy! There are a growing number of cookers that include a brown rice setting along with others these days, but if you want to know which the best ones are, read on! The first thing you need to know if you choose to cook brown rice in a rice cooker, is that it needs a lot more water to cook than what white rice needs, so make sure its capacity is large enough for the number of cups of uncooked rice you want to cook. An issue that is important to note about these rice cookers is that all use the Japanese measurement of a g̵ō, which is the amount of rice one person will eat at dinner. This usually measures ¾ of a cup in English or American measurements and this is what the measuring cup that comes with the cooker normally holds. While having a brown rice setting is nice, it’s not necessary if it has a timer. A keep warm setting is also nice for brown rice, as the last few steaming minutes ensures a fully cooked and fluffy end product. Check to see if the inner cooking pot is non-stick or stainless steel. The former is easier to clean, as the rice won’t stick, but the latter is probably safer, as there’s no danger of any non-stick coating getting into the food. We have also reviewed the best rated rice cookers overall. This compact and sturdy Aroma 8-Cup rice cooker is easy to use and keep clean and will produce between 2 and 8 cups of cooked rice at a time using the included measurement cup. It combines a keep warm function, a 15 hour time-delay function, white rice and brown rice functions. A steamer tray is included so that you can cook perfect rice below and vegetables or meat on the steamer tray. All of its functions can be selected digitally, so it’s really just one click and you can start cooking. The steam tray, rice serving spatula, rice measuring cup and recipe book are all included, as well as coupons for Mahatma and Carolina brands of rice. You have to be careful to empty the water/steam collector tray that sits on the side of the pot because otherwise this can overflow. The pot is aluminum with a Teflon coating so you should not use metal spoons with it. The Tiger Corporation Micom 5.5 cup is a favourite. One of the best things about this rice cooker is the Menu Book for using the “Synchrony-cooking” function; you can cook so many great dishes in a single go – Chicken Teriyaki and Rice, Swedish Meatballs and Rice, and as a brown rice cooker, you just select the brown rice cooking function from the panel of icons at the front of the cooker. Plain rice and slow cooking are the other two functions and there’s a keep warm function that it switches to automatically when cooking is done. The rice cooks below and the steam rises to cook the other foods on the food tray above. This tray only has steam vents on the sides, so flavors and liquids don’t fall into the rice below. Tiger is a well-known brand of rice cooker and it makes brown rice with a slightly chewy, but tender texture keeps the flavor of brown rice perfectly. The keep warm function doesn’t dry out the food and it has an easy to clean inner pot. The JBV-A1OU Micom 5.5 model is fast at cooking good brown rice, needing about 1hr and 10mins to cook a full pot. It does not alert you when the meal is done, nor can you set it to start cooking at a later time. It is packaged with a removable and washable steam vent, a BPS-free cooking tray, a spatula, rice measuring cup and a non-stick inner pot. The Zojirushi NS-ZCC10 has been so well-reviewed that you just want to rush out and buy one! There are many reasons for this. First of all, unlike the other brown rice rice cookers reviewed so far, you can remove the top lid completely for easy cleaning. The fuzzy logic feature makes fine adjustments throughout the whole cooking time, so you don’t just use a single, all-round setting – and the brown rice is cooked to the most perfect texture. This is due to the longer pre-heating time for brown rice which allows for better water absorption. 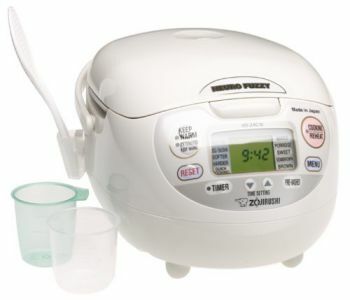 The Zojirushi NSZ-CC10 5.5 cup model needs 1hr and 46 mins to cook 5 cups of brown rice. This is the longest time needed for cooking brown rice in a rice cooker because Zojirushi lets it cook for longer, at a lower temperature – this way the individual grains do not disintegrate and are well-separated. Another feature which contributes to the perfection of the rice, is the spherical, extra-thick inner cooking pan. In addition to several menu selections for white, brown and sushi rice, you can select quick cooking, porridge, no-rinse and steam. There’s also a short keep warm function, an extended stay warm and a reheat function. You can program the cooker for delayed cooking too. This model just may be the best brown rice rice cooker available although it is also the most expensive in this list. This cooker also has stay-cool handles and all the moisture from the cooking process is released by the stem vent. There’s no steam capture cup. It comes with a nonstick rice spoon, a rice spoon holder, 2 measuring cups, and recipes. The award goes to the Zojirushi NS-LAC 05XT Micom, a lovely little rice cooker with the dimensions 10.7/8” x 8.3/4” x 7.7/8” so it takes up very little room on your kitchen bench and can cook up to 3 cups of plain raw rice. Its features are very similar to the NS-ZCC10 model above, including the menu selections and fuzzy logic cooking. It has a special setting for brown rice and comes packaged with two measuring cups, a spatula and some recipes. Most people absolutely love it and called it smart, but a few wish it would could brown rice a bit faster. Still, considering that the rice will never brown at the bottom and will always cook perfectly, that’s a small price to pay. The Aroma Simply Stainless Rice Cooker draws some mixed reviews and it is a conventional rice cooker, so there is no special setting for brown rice. Instead, you switch the lever on and when the rice cooks it automatically switches to the warm setting. You have to unplug it to turn it off; something some buyers don’t like. Although they really like the stainless steel cook-pot, as opposed to pots with teflon coatings for non-stick cooking, some reviews stated that rice can stick to the bottom of the cooking pot. One reviewer advised owners to add a little bit of olive oil to the bottom of the pot before switching it on. The Aroma 6 cup model makes 3 cups of uncooked white rice and 2 cups of uncooked brown rice. It’s packaged with a measuring cup and spatula for rice serving.